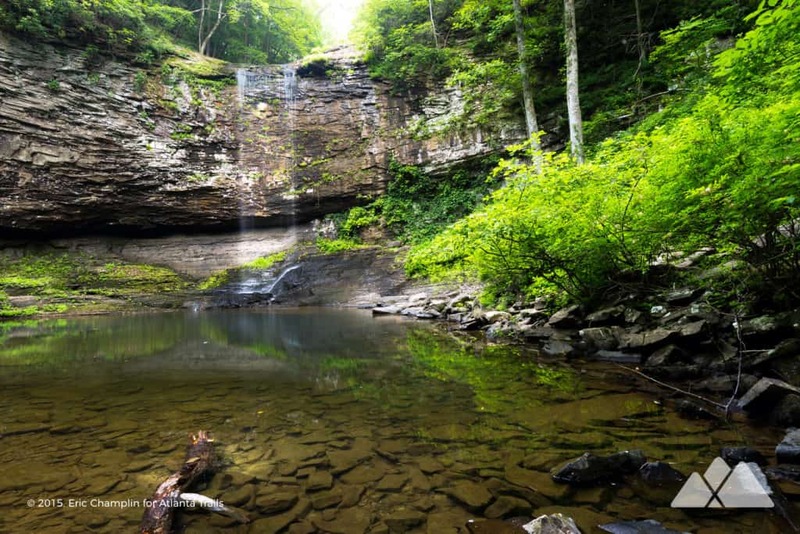 Hike the popular Waterfalls Trail at Cloudland Canyon State Park. Descend the steep canyon walls via stairs to two waterfalls, Cherokee Falls and Hemlock Falls, that cascade in the beautiful, steep-walled canyon. North Georgia’s Cloudland Canyon offers stunning views deep into its waterfall-filled depths and across its wide expanse. 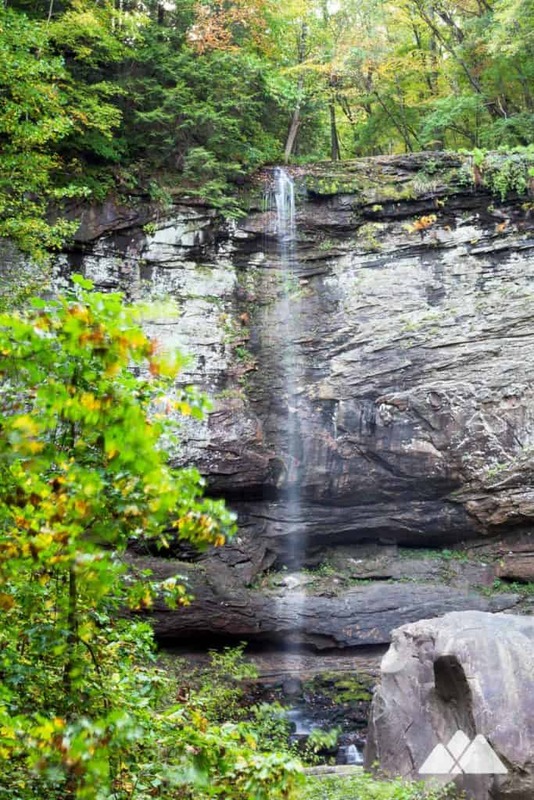 The park’s most popular trail, the Cloudland Canyon Waterfalls Trail, drops from the canyon’s towering walls to its floor and hikes to two stunning waterfalls, Cherokee Falls and Hemlock Falls. Though this out-and-back hike is only two miles, it’s a difficult trek: the trail drops over 400 feet to the waterfalls before climbing to return to the trailhead. The hike’s many stairs are a workout, for sure: but the beauty of the falls make the hike so worthwhile. 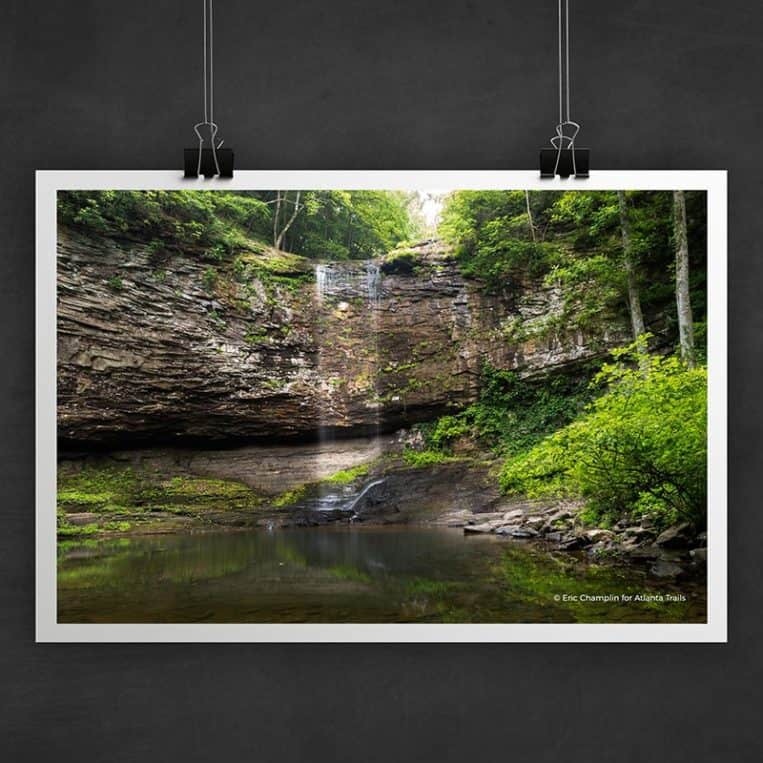 The Cloudland Canyon Waterfalls Trail departs from the East Rim parking area (view maps and driving directions), hiking the paved trail that skirts the canyon’s eastern walls. Views here from the canyon rim are incredibly beautiful in any season – though they’re especially gorgeous in autumn when the canyon’s deciduous forest explodes in vibrant, colorful fall leaf colors. 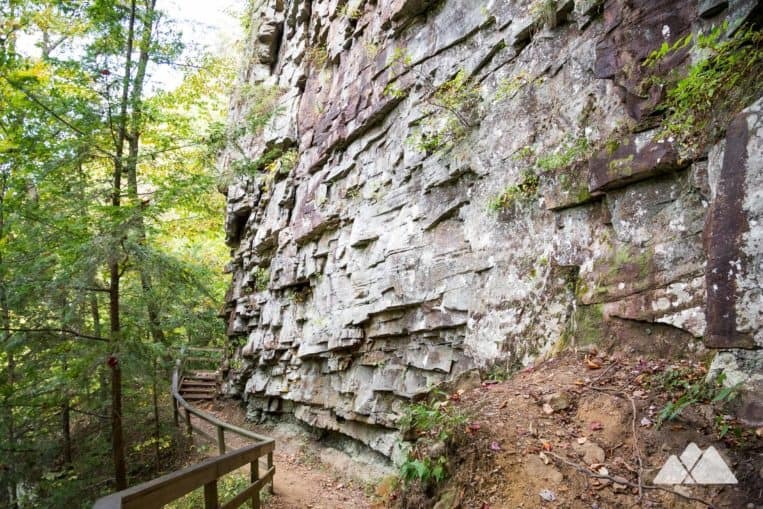 The Waterfalls Trail splits from Cloudland’s West Rim trail at .25 mile, turning right to drop deeper into the picturesque canyon, hiking northbound. 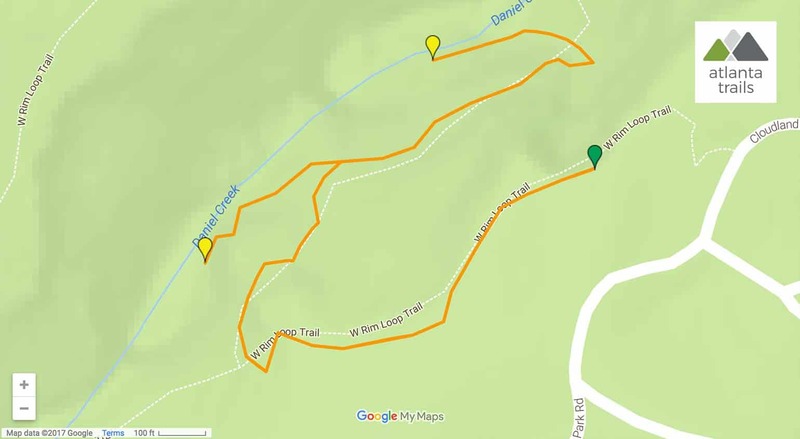 The trail crosses a variety of surfaces as it drops elevation, alternating between dirt paths, wooden boardwalks, and long stretches of metal stairs. Steeply-chiseled canyon walls hug the trail’s sides for much of the descent – and posted signs warn of the danger of falling rock from overhead. The trail reaches a second intersection at .45 miles, turning left here to hike to the first waterfall, Cherokee Falls. Cherokee Falls plunges 60 feet into a clear blue pool of water, Sitton’s Gulch Creek dropping from an immense, arced rock outcrop. The waterfall varies in intensity with seasonal rainfall, ranging from a roaring drop to a mere trickle. Colorful mosses, lichen, and vines cling to the enormous rock wall, and mossy boulders litter the canyon floor beneath the falls. The trail departs Cherokee Falls, retracing the hike to the second trail intersection. The trail approaches the second waterfall, Hemlock Falls, following the Waterfalls Trail through a second stretch of boardwalk and stairs. The hike reaches the Hemlock Falls wooden viewing platform at just over 1 mile. Hemlock Falls drops over 90 feet from an arced rock wall, plunging into the surrounding boulder-filled canyon floor. Departing the immense waterfall, the hike retraces its outbound route to the trailhead, climbing 600 stairs to Cloudland Canyon’s east rim. 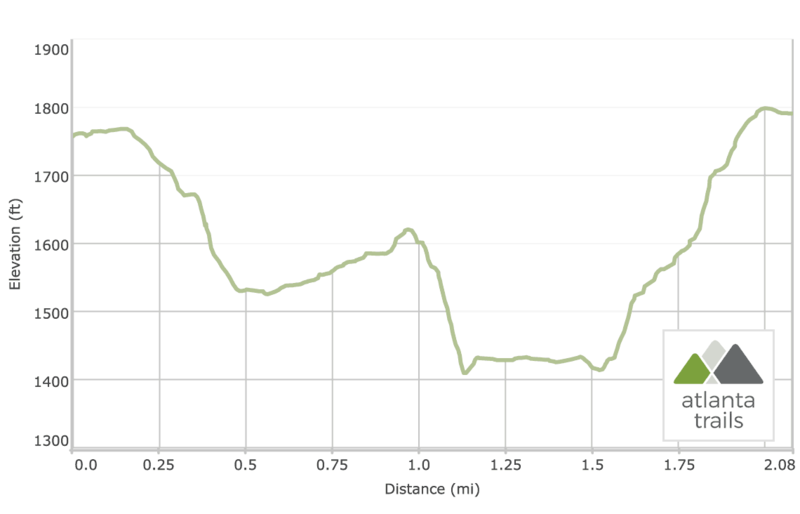 The trail reaches the trailhead at just over 2 miles, completing the view-packed adventure. Have energy (and daylight) left to burn? Continue following the creek downstream, crossing the wooden bridge just below Hemock Falls on the Sitton’s Gulch Trail. This 5.1-mile roundtrip hike explores a series of smaller waterfalls and the boulder-filled floor of the canyon, and visits wide meadows filled with warm-weather wildflowers at the trail’s end. 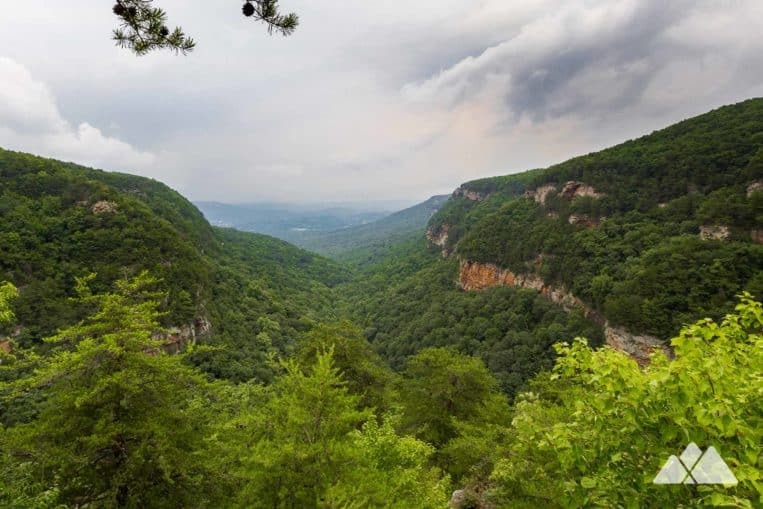 And check out more of our favorite outdoor adventures in this beautiful park in our Cloudland Canyon State Park adventure guide. Outside of the park, chase some more ultra-scenic waterfall adventures near Chattanooga. Don’t miss the incredible Foster Falls, easily one of the most beautiful cascades in the South. Hike to two falls on the incredibly scenic Rock Creek at Lula Lake Land Trust. Hike a strenuous stretch of the Fiery Gizzard Trail, exploring tumbling cascades in a mossy, boulder-filled forest and scoring beautiful vistas at Raven Point. Or explore the enormous, single-drop cascade of Greeter Falls at South Cumberland State Park.